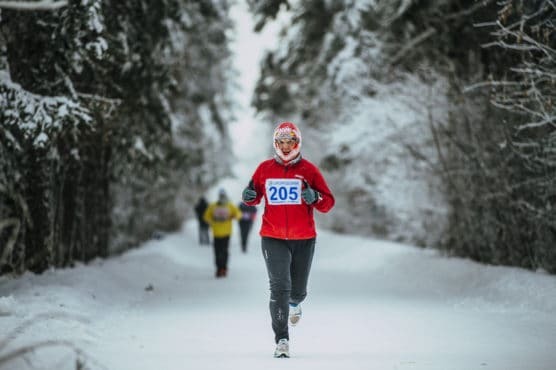 Even for lifelong runners, February can be a tough month to stay on track. The days are still short and the weather is chilly in most of the northern hemisphere. How can you stay on track throughout the shortest month of the year? Whether it is a real race or a virtual race, signing up for a race is one of the easiest ways to stay focused. If you are able to do a tune-up 5K or even just test yourself in a mile, this is the perfect opportunity to get a baseline for fitness. Or, if you aren’t in a place in your training to actually execute the race, consider signing up for in early spring and use that as motivation to get moving. Try a new workout, run with different friends, or check out a new spot to run. Sometimes just the simple change of busting out of your routine is enough to get motivated again. It doesn’t have to be anything crazy, but we often fall into doing the same run over and over again and it can get monotonous. Maybe you got some new gear over the holidays and it was exciting to try it those first few weeks of January. Try a new playlist or something inexpensive like new socks or hat. If you are the kind of runner motivated to earn your gear, consider rewarding yourself after a certain number of miles or hours of running. For some runners, this is impossible. Your professional or personal life might not allow for you to step out and sweat during daylight hours. But for those that have this as an option, February is the perfect time to put this to good use. Not only will you benefit from the vitamin D, but you’ll also enjoy warmer temperatures and knock out a workout without sacrificing sleep or family time. The shortest month of the year is also the easiest month to set a month-long goal. Maybe you want to run a mile every day. Maybe you want to stretch after every run. Yes, it is only 2-3 days shorter than all the other months, but somehow, it seems so much more doable in just 28 days. How do you stay motivated during the the shortest month of the year?